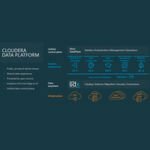 Layer2 announced version 3.5 of the Business Data List Connector for SharePoint (BDLC) that seamlessly connects almost any external enterprise data and processes with SharePoint. It bridges many gaps that still exist with default integration. Microsoft SharePoint technology is increasingly used as a business collaboration platform for the enterprise and the web, to connect and empower people and additionally to cut costs with a unified infrastructure. Organizations can rapidly response to their business needs using SharePoint. The seamless integration of external line-of-business data, e.g. from SQL databases, Office files, LOB applications, and the cloud is a common requirement in the use of Microsoft SharePoint technology. 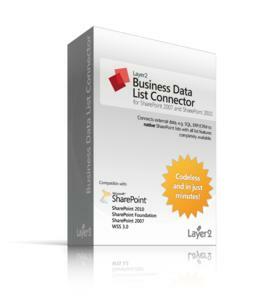 The Business Data List Connector for SharePoint (BDLC) solves many known issues and overcomes limitations that still exist with SharePoint data integration using the out-of-the-box SharePoint 2007 Business Data Catalog or the SharePoint 2010 Business Connectivity Services. With the Business Data List Connector for SharePoint (BDLC) it is not only about surfacing data in SharePoint, it’s about deeper integration. 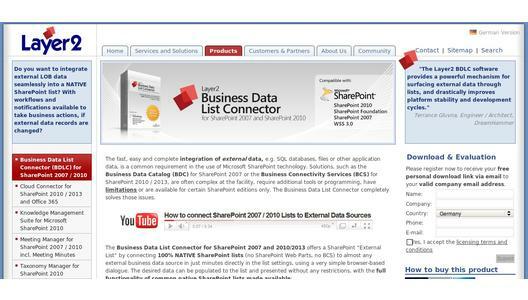 BDLC connects external data sources to native SharePoint lists, e.g. contacts, tasks, events or custom lists to replicate data changes in background. This straightforward concept makes all the powerful SharePoint list features available for external data without any restrictions. No programming or additional tools are required to connect. The BDLC can easily be configured in the default SharePoint list settings dialog with a few simple settings, such as connection provider, connection string and a common SQL query statement. The current version supports almost any data source, e.g. databases like Microsoft SQL Server and SQL Azure, MySQL, Oracle, Informix, DB2, AS/400, Applications like Active Directory, Exchange or SharePoint, ERP/CRM systems like SAP, Navision, Dynamics or Salesforce, cloud-based services like Twitter, Facebook, Google and generic provider like OLEDB, ODBC or other custom .NET-based provider. The desired data can be populated to the list and presented with the familiar UI and navigation features of native SharePoint lists: Views, sorting and grouping, filters, calculated fields. Lookup relationships can be created as usual for SharePoint lists. The BDLC extends the SharePoint collaboration, search and knowledge management capabilities as well as the Office user experience to include external business data and associated processes. In addition, it simplifies the SharePoint platform architecture and increases performance: SharePoint users do access SharePoint lists only, as a local “cache” of external enterprise data. The connected SharePoint lists can be updated manually on demand using the Office ribbon or automatically in background, using a SharePoint timer service. List data change notifications per RSS or email and even workflows can be established as usual to take business actions in SharePoint when external data items are changed. For example the Business Data List Connector can be used to implement a sales dashboard application, which empowers end users to gain insight into the underlying ERP or CRM data in a reusable way, e.g. with aggregations and transformations and quickly being notified in case of changes. A write-back to data source feature can be additionally enabled for bi-directional replication or data acquisition, if required. Several add-ons are available at the vendors web site, e.g. to re-establish database-like foreign key relationships between BDLC-connected lists or to connect external data to the Microsoft Office 365 or Microsoft SharePoint Online cloud. The Business Data List Connector comes with a robust installer to allow it to be easily deployed within any SharePoint environment, including farms. It is available for SharePoint starting with WSS 3.0, MOSS 2007 and SharePoint 2010 Foundation or Server. You can register and download a completely free shareware edition directly at the vendor’s product pages at www.layer2.de/en/products. A cost-free partner program was launched to support companies that are interested to implement and resell Layer2 SharePoint products around the world. Partners receive up to 30% commission for each sale. Additionally SharePoint service provider can receive qualified leads, free NFR versions and priority support to accelerate their own SharePoint projects by implementing Layer2 solutions. As a Microsoft Gold Certified Partner and ISV based in Hamburg (Germany), Layer2 is one of the leading providers of Microsoft SharePoint extensions in Europe with a major focus on Data Integration, Collaborative Knowledge Management and Social Networking. Layer2 has also been known as a reliable partner to customers in Central Europe, offering additional consulting and services in the fields of SharePoint, .NET programming and IT infrastructure for almost 20 years.